Has India been calling you? Her seductive voice reaching out and invading your imagination? The sounds of sitars and manjira filling your mind? The aromas of cardamom, ginger, cloves and turmeric tickling your nose? Have you been wondering if you can do it? You can. Everyone’s experience is different and many factors led to our leaving early. Now that I’ve been, I have some advice that might help you. Many people have suggested that perhaps if we had started in the south, our experience would have been different. Travel legend says that the south is easier, more laid back and prosperous than the north resulting in a better entry for beginners such as yourselves. I have heard this from enough people to suggest that if you are building an India itinerary you should start in the south. The beaches of Goa are lovely, the backwaters of Kerala are quiet and tranquil…why start in the hustle and bustle of Delhi? Leave that for later when you are hardier…start slow and start south! Someone emailed me to ask if I thought that being on a tour would have changed our experience and I have to say undoubtedly that yes, I think it would have made huge difference. We managed to see many of the sights on our own, or with a car and driver, but lacked the cultural context for much of it. A tour guide would provide that cultural context along with historical references, local flavor, and general support. Having other travelers, and a guide, to help us decipher what we were experiencing would have helped us put it all in perspective, helped us understand our reactions, and helped us manage our emotions around it all. I think we felt isolated; from other people and from each other; company would have helped fill the void. Tour operators and tour guides know the area they work in. They have connections; know where to go, how to get there, and where to stay. They can help you have experiences that you wouldn’t normally have access to and can usually translate so that those experiences are more meaningful. We considered a tour but didn’t sign on for one because we felt the cost was too much and because we thought we could just as easily do it on our own. I would now argue that the cost might be worth it! GAP Adventures and Intrepid Travel are two companies that I would consider were I to go again. Without doubt, all the people that have reported to me that they had a tremendous time in India found a way to make a connection to the country, her people and her culture. Some people make a spiritual connection through Buddhism and meditation; finding a way to share their beliefs and reaching into themselves to draw out the strength they need. I saw, at the temples, Westerners circling stupas and prostrating themselves and heard of people heading off to retreats and ashrams to meet their guru and engage in silent introspection. It seemed like a good idea…but too far out of my comfort zone at the time. Yoga is another great way to make that connection. Heading to a studio to practice whatever-form-of-twisty-pretzelly-yoga you practice is sure to find you some friends and a great introduction to one of the oldest forms of exercise known to man. I’ve seen people make a connection over something as simple as sharing a cigarette lighter at a bus stop…it doesn’t take much, you just have to find an ‘in’ and then be brave enough to take it as it comes. She is a seductive mistress; the draw is strong; the desire overwhelming; the lure indescribable. It’s not something to pass up for the sake of fear. India. If she’s been calling you, you should go. Great tips! I’ve heard such vastly mixed views of India, it’s great to see ways to ease into it. Interesting as to your thoughts on going on a tour. What’s your preferred travel style? Independent? I can certainly understand getting a guide for certain places, but do you really think its worth it the whole time? (Full disclosure, I really despise tours but have had experiences where they come in handy). @Aaron: yes, we’re normally independent travelers. When traveling long term you have much more time available than a typical traveler and so tours seem rushed and cramped so I would suggest perhaps a short tour of a week or so at least. Use it to get your bearings and ease into the country. The guide can give local information and you can learn the best ways to get around. Using a combination of tour and independent travel probably offers the best of both worlds! cheers! This is the first time I’ve heard the advice to start in the south, and now hearing it, it makes a lot of sense. Starting in the quiet and moving into the loud could be the most sensible India tip there is. I’ll be going there for the first time in Feb for 30 days and just might reverse my plan. I am not sure about a tour, although it may be a good idea for more inexperienced travellers, but I do agree with everything else. We much preferred the south and had great experiences in homestays in Kerala. I would also add: take things slowly and allow yourself a bit of luxury when things get too much. India has been calling and I hope to answer in the next couple of years! After reading about your experiences in India and those of a few fellow travelers, I think starting in the south may be just the path I take…! We enjoyed the south much more than the north, but I’m glad we saw a bit of both. The south isn’t all puppies and rainbows, but I do agree that it a lot easier to travel through than the north. We ended in the south, and it may have been better to reverse our route. Another suggestion I have is to fly to whatever destinations you want to see. 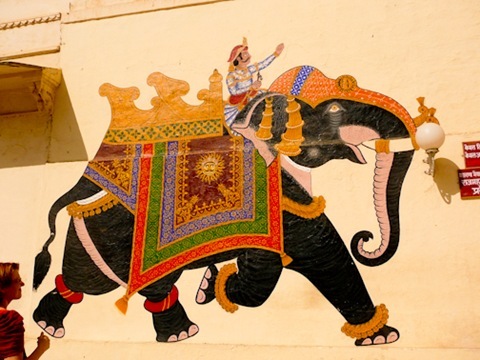 India is a big country, and while we normally like to travel more cheaply and slowly overland, flying helped us see what we wanted with a minimum of long, crowded, stressful trains. Also, consider breaking up your India travels by stopping in the Andaman Islands, which can only be reached from India’s mainland. The islands are still India, but the laid back nature, turquoise waters, and white sand beaches are a world away. But I think it’s also important to give yourself enough time when traveling to India. This is a difficult country to visit for a quick holiday as it takes quite some time to adjust to the intensity and way of life. For those with only a few weeks to spare, I think it’s far better to pick one small region of the country instead of trying to visit everything. The long train rides alone are enough to sap the energy from you and in the end, while you might get a chance to see every site you wanted, you can end up plodding through them, exhausted and frustrated. And I’ve found that in India, rewarding experiences await the traveler no matter where you end up going. Just get off the bus/train in any random town and you’re bound to have a memorable day or two! I have been here almost two months and there are several factors why some westerners have a difficult time here in India. Most just visit the tourist areas in the north which are dirty and poor. Many poor people play on the western minds, many of those people are fakes just out for money. The tourist areas are filled with beggars, hawkers, and touts that are skilled at messing with the emotional mind of the Westerner. Many tourist stay in the backpacking ghettos in the cities such as Sudder st in Calcutta and other areas where many touts pry the streets for the ignorant tourist. Many of these backpacker ghettos are dumps and dirty areas. Most travelers don’t take time to figure out the train system. Most Westerners only view the infrastructure and don’t take time to learn the deeper culture dynamics of the cultural of India. The bottom line is that the dirty and poor looking infrastructure smacks westerners in the face. A person can write all they want about India, but the bottom line is that traveling is slow, the external infrastructure is a garbage dump in the towns and cities, there are lots of faking beggars that will play on your mind acting that they are dirt poor, but they all have cell phones and TV in their homes. Finding some good friends will change this entire picture in India, and visiting more local areas, the areas that the Indian Tourist visits are worth it. I particularly liked your idea of connecting to the country through various means, but what I should appreciate you for is the fact that the role of local tour guides could make a huge difference. The context, as you’ve mentioned, is very important. Without it, you could see things with your eyes and take some photos without knowing what’s what. In my country, it’s the same and even more essential as fewer people speak English in Iran, specially in rural areas. Indians study in English at school, but Iranians have to go to language schools themselves to learn proper English to be able to properly communicate. She really hasn’t been calling me, but I still find her fascinating. This seems like great advice, especially about starting in the south. I haven’t been there and honestly will admit that it is a bit intimidating to me, so that struck a chord. Much like I think starting Europe in the UK or Ireland is a great way to get introduced to that continent. India has been calling me for some time now and I have def. felt the – “no i can’t go to India now, I have to travel more first!” feeling. Thanks for helping me shake that, maybe I’ll have to pop up higher on the list. I’m in the process of deciding where I will be moving abroad to again in a little less than a year and India is one of my choices. I love places off the beaten path and with a culture entirely different than my own. I’m not sure if I’ll end up moving there, but it is insanely high up there on my list of countries to visit (which is every single one of them on earth and even the moon if I could haha). Thanks for sharing and for the great advice!!!!!! I love the India acronym…that’s hilarious! I wish you all the best in your decision and move to India! I’m convinced that finding a connection there is the key to enjoying it and moving there guarantees you connection! I’m sure it will be amazing! Good luck and let me know how it goes! Lovely article and spot on! I’ve been there on two big trips and continue to think about…” oh that time in India” my time there is like my favorite child – I compare all trips to the ones to India. Travelers should not be afraid of India and you point out the wonderful ways to get over any fears. Traveling there is like anything I think – scary at first and then you get into the flow. Thanks for the article! Gillian – I’ve just read through all of your posts on India…I have been meaning to for awhile (I remembered reading somewhere about your leaving early), and I’m sure glad I did. Your honesty through it all is VERY much appreciated, as the thought of going to India scares me as much as it excites me. I expect that I “can” do it, but wonder about how much I would enjoy it. Yes, travel is not all about the good stuff and the hardest times are probably where we learn most, but I still don’t believe in doing something “just because” it is the thing to do. Anyways, thanks for your honesty, and the tips, which I will use when (IF!) the time comes! I believe that to be true Jessica. Very true. Gillian recently posted..The Ultimate Train Challenge: Are You Up For It?